After spending so many years in your home, you have become immune to the drone of the shower and the chugging of the laundry machine. Even when your furnace makes a strange noise you tend to just ignore it. But that isn’t a good idea as there are some noises your furnace makes that you shouldn’t ignore. Just like an old RAZR slide phone, your 1998 Hyundai Elantra and decade-old Doc Martens, you can still count on your furnace to heat things up when the temperatures inevitably drop to an uncomfortable level. And those strange sounds your furnace makes might be a sign that it is at the end of its life. 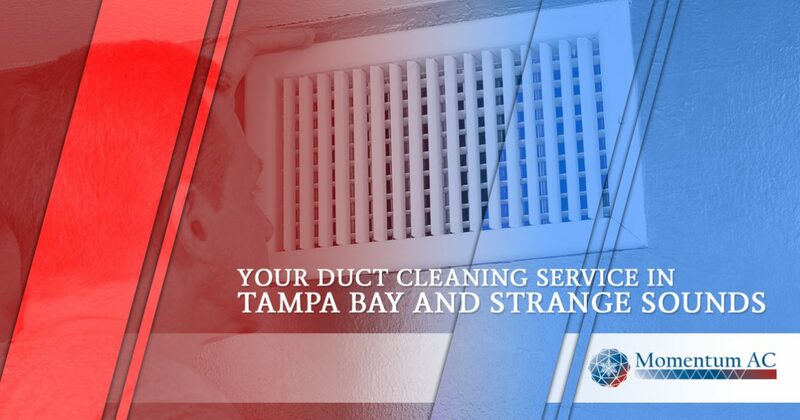 The strange sounds could also mean you just need a minor repair by Momentum AC, your duct cleaning service in Tampa Bay. Here are a few common sounds your furnace might make and what they could mean. A metal on metal scraping sound could indicate a loose or broken part. It could be the blower has come loose from the motor shaft and is scraping on the casing that encloses it. This is a relatively easy fix that won’t take us long to do. Now, the scraping noise could be something more serious, like a broken blower wheel or motor mount and both of these problems need to be addressed right away. 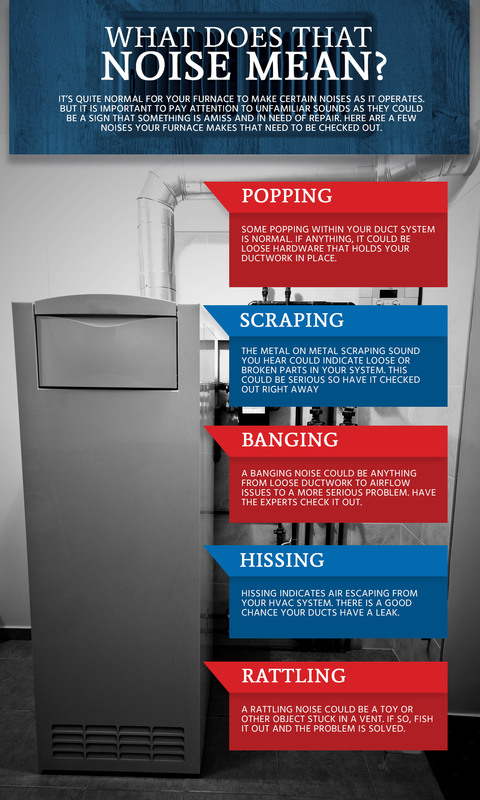 In any case, when you hear a scraping noise coming from your furnace, turn it off and give us a call. If you have metal ducts, keep in mind that it will expand and contract when your HVAC system turns on and off. If the popping does come from the duct work, double check the hardware that holds it in place and insert foam in trouble spots to reduce the noise. A banging noise when you first turn on your furnace could be a duct issue. You might have air flow issues so check your filter and check for closed vents that need to be opened. A banging noise could also indicate a more serious problem, like a faulty pilot light or a dirty burner. Again, a call to us and we can resolve the issue. A rattling noise that comes from your ducts could be something that fell into the vent, like a kid’s toy or screw or the pen you lost the other day. You can simply remove the register yourself and fish out whatever may have fallen in the duct. A hissing noise means air is escaping from your system. If the noise is coming from behind the walls, there is a pretty good chance you have a leak. Duct repair isn’t something you should tackle on your own if you don’t know what you are doing. It takes more than watching a three-minute YouTube video to learn how to make repairs like this. A light hissing noise that you hear through the vents might indicate a problem with the filter. It might be the wrong size or placed incorrectly. If your furnace is making funny noises, call Momentum AC right away.